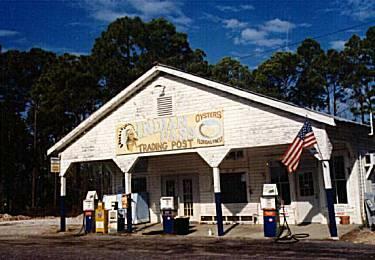 Indian Pass is located at the extreme West end of Apalachicola Bay where it flows into the Gulf of Mexico. This conflux of fresh and saltwater makes one the most fertile estuarine areas of the world. While the area was settled by Native Americans for thousands of years and then again by the early European explorers modern civilization has conveniently skipped us over. Long Known as Florida’s "Forgotten Coast" most of the inhabitants here have fins or feathers. No high rises or motels but miles of unspoiled beaches, succulent oysters, world class fishing and spectacular sunsets. Beachcombers are greeted by miles of shells, fossilized shark teeth and pottery shards from our earliest inhabitants. Indian Pass FL is located between Apalachicola and Port St.Joe FL, one hour’s drive east from Panama City and a two hour drive east from Destin and the trendy beaches of South Walton (Grayton Beach, Seaside, Watercolor and Rosemary Beach). St. Vincent Island, located directly across from the campground is 10 miles long and over a mile wide. A National Wildlife Refuge, it has no human inhabitants other than the occasional ranger. It is the only home in the western hemisphere to Sambar deer. Weighing in 600 to 700 pounds they resemble a herd of horses on the beach more than deer. Bald eagles soar the skies while red wolves, wild boar and whitetail deer roam the interior. Indian Pass is "Old Florida" at its best. Located on Florida's Forgotten Coast between Port St. Joe and Apalachicola, Indian Pass is the gateway to St. Vincent Island National Wildlife Refuge. This small peninsula divides Indian Lagoon from the Gulf of Mexico and remains one of Florida's best kept secrets. Indian Lagoon boasts some of the finest oysters available anywhere, and the nutrient-rich oyster beds provide food and shelter for a variety of salt water fish. The beaches on the Gulf side of the peninsula are a popular nesting ground for the endangered loggerhead sea turtle, as well as a variety of shorebirds. Camping is such a fun thing to do and Indian Pass Campgrounds is a great place to do that. The beautiful scenery of Florida is all around Indian Pass Campgrounds, if you love the outdoors you will like Indian Pass Campgrounds. Many people like this campground. Camping brings many people to Indian Pass Campgrounds, you're sure to like Indian Pass Campgrounds too. A visit to Florida is not complete without some camping. We are located in one of the premier fishing destinations in this hemisphere. We are also fortunate enough to represent the areas finest guides. Whether sight fishing the flats in the back country, cranking up limit catches of Red Snapper offshore, or battling giant Tarpon along the beaches we have guides and boats that specialize in all of the Indian Pass fishing opportunities. Speckled Trout and Redfish are available all year with the cooler months usually producing the most outstanding catches. The "Silver King" migrates to our area in the early summer with July and August being the best months for Tarpon fishing. These ancient creatures average over 100 pounds and world record hook ups are a constant possibility. Offshore fishing for Red Snapper and Grouper is a "sure thing" all year. The warmer months usually offer a calmer weather pattern. For the sight fishing enthusiast huge Triple Tail float on the surface during the summer while Redfish roam the skinny water of the flats and oyster bars during the winter. For those that would rather capture pictures we offer eco-tours and sightseeing trips. Scalloping trips are also available in season( July-Labor day) with all snorkeling gear included. 240 - Oldest pottery shreds found on St. Vincent indicate Indians inhabited the island at this time. 1633 - Franciscan Friars named the island while visiting Apalache tribes. 1750 - Creeks and Seminoles, offshoots of the Creek nation, entered area and inhabited the island. 1868 - George Hatch bought island at an auction for $3,000. Hatch's grave is the only marked grave on the island. 1908 - New owner, Dr. Pierce, spent about $60,000 importing Old World game animals. 1920 - Island-grown beef cattle were sold to Apalachicola markets. 1940 - First oyster lease granted. Pierce Estate sold first pine saw timber. St. Joe Lumber Company built a temporary bridge to island for timber removal. 1948 - Loomis brothers bought island for $140,000 and imported zebras, elands, black bucks, ring-necked pheasants, Asian jungle fowl, bobwhite quail and semi-wild turkey. 1968 - St. Vincent purchased by Nature Conservancy for $2.2 million. U.S. Fish and Wildlife Service repaid Conservancy with money from"Duck" Stamp sales. Established as St. Vincent National Wildlife Refuge. Tucked away where Indian Pass Rd. meets St. C-30A is Indian Pass Raw Bar, a magical place where the past echoes loudly. A place that generations have called their own, featuring the best seafood in the world prepared casually. Directions To Indian Pass Raw Bar: Get to either Port St. Joe or Apalachicola on Highway 98 and drive toward the other town. Turn onto state road C-30A (look for signs for Rish Park on Cape San Blas) and drive. In about ten minutes turn either right or left, depending on which direction you are driving, into our parking lot. Throw open the car door and kiss the ground. You are here! The Raw Bar traces its roots back to the commissary/company store for the turpentine operation which began here in 1903. The building as it stands today was constructed in its present location to take advantage of any highway traffic resulting from the building of the highway in 1929. In the early 1930's Mrs. Gypsie McNeill (Jim's Grandmother) served noon meals and catered dinner parties in the east portion of the store -- so the business has come "full circle" from its beginning. The Raw Bar phase actually began in 1986 after hurricane "Kate" virtually destroyed the wholesale oyster businesses in which the McNeills were extensively engaged. Having more oysters than we could eat ourselves, and not enough to continue wholesaling, the decision was made to open the establishment as it is today -- Simple But Good. We are able to maintain a quality product due to having leased oyster beds in the western portion of Apalachicola Bay at Indian Lagoon.